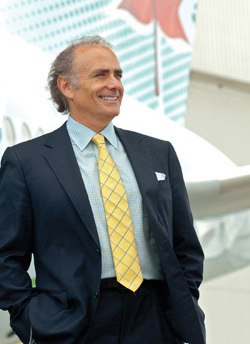 Alumnus Calin Rovinescu's distinguished career in corporate law, as a managing partner with Stikeman Elliott, and in business, as cofounder of Genuity Capital Markets, served him well when he became President and CEO of Air Canada in 2009. Under his leadership, and during a time of economic turbulence, he piloted the company's rise from the brink of bankruptcy to soaring profitability while eliminating the significant drag of its $3.7 B pension plan deficit. As a result, in 2013, he was named Canada's best CEO by Report on Business. Madame la Chancelière et très honorable Michaëlle Jean, Monsieur le Recteur et Vice-chancelier, l’honorable Allan Rock, chers membres de la Faculté de sciences sociales, distingués invités, parents, amis et consœurs et confrères diplômés 2014 de l’Université d’Ottawa, c’est avec fierté et humilité que je m’adresse à vous aujourd’hui. I graduated from the University of Ottawa in 1980. In 1980, there was no Internet, no World Wide Web, no personal computers. In 1980, “digital music” was when you pushed the on/off button of your 8-track with your index finger. In 1980, there was no Charter of Rights and Freedoms. In fact, back then, the closest thing we had to a Charter of Rights was the Ten Commandments. In 1980, a pioneering Canadian company, Bell Northern Research, based in Ottawa, was at the forefront of next generation telecom – it had yet to become Northern Telecom, once the most valuable company in the country. So, yes, I have been privileged to see, before my very eyes, our country -- and indeed our world – progress, innovate and transform rather dramatically and quite irrevocably. But instead of boring you with an old-timer’s nostalgia, let me summarize for you, in three simple words, the most basic tools I've learned to use since I left the comfortable confines of the University of Ottawa 34 years ago. And there is no doubt in my mind that these three words were not only relevant over the past three decades, but are all the more relevant as you are about to embark on your careers in this stimulating, but hyper-competitive, global world where innovation, risk and speed have a much greater advantage than ever over “the way we always did things”. Connaissance : Nous ne savons pas ce que nous ne savons pas, et il y a beaucoup de choses que nous ne savons pas. Les amateurs de physique quantique, notamment les réalisateurs de documentaires comme What the Bleep Do We Know, ont beau dire que le mystère est parfois nettement préférable à la connaissance. Je ne suis pas d’accord. Selon mon expérience, la quête inlassable du savoir, sous toutes ses formes, peu importe la façon dont on la mène, n’a pas d’égal. Chose certaine, votre apprentissage ne se terminera pas quand vous quittez l’université. À preuve, certains grands cerveaux, comme Steve Jobs, Bill Gates et Mark Zuckerberg, ont pris des moyens originaux pour acquérir des connaissances : ils ont quitté l’université, ont fait équipe avec des amis dans des sous-sols et des garages, et ont littéralement changé le monde en créant des entreprises comme Apple, Microsoft et Facebook au cours des dernières décennies. So my first message to you is that, one way or another, you need to develop, to nurture and to feed your voracious appetite for knowledge conventionally or unconventionally. And to satisfy that appetite, you will generally need the help of others. I can guarantee you that every person you will meet on this planet will know something you don’t, and it’s up to you to find out what that is. This is something I learned early. My father was a surgeon, a urologist who, with $60, a couple of suitcases of clothes, and at nearly 40 years’ old, immigrated to Canada from Romania with my mother, a teacher with a couple of university degrees and some knowledge of cultural affairs in China. What they had of value, and what carried them though, was not what was contained in those suitcases, it was what was contained in their heads. It was my parents’ “knowledge” – their professions, their skills, their confidence – that enabled them to rebuild their lives here, providing their children with fantastic opportunities, as I have been privileged to have. We are constantly learning and gathering knowledge as we move from one stage of our lives to another. From one experience to another. From one job to another. From one relationship to another. And knowledge is, of course, infinite. You never really stop absorbing it or indeed distributing it. And giving younger people that first experience, that first sink or swim opportunity they never dreamed of, or exposing them to some of the places that they could be from in the future, is actually even more empowering than receiving knowledge. In that regard, the one anecdote I want to share with you is from 1986. I was a 30-year-old lawyer at the Stikeman Elliott law firm and had just finished working on the Air Canada privatization. After the closing, the CEO of Air Canada, Claude Taylor, invited me to a lunch at a private club to get my views of what was needed for Air Canada to move successfully into the private sector after having been a crown corporation for 50 years. Imagine: a young lawyer having a one-on-one with the CEO of Air Canada….well, as you can see, that one empowering lunch has certainly had an influence on my life. Which brings me to courage. Fear paralyzes. Absolute fear paralyzes absolutely. With all the knowledge in the world, we get nowhere without courage. Courage to leave. Courage to stay. Courage to change or be an unreasonable catalyst for change in others. Courage to be honest. Courage to draw a line in the sand – whether in a relationship or in a business. Courage to admit your mistakes, to avoid the temptation to hide and to rectify things, early and quickly! Lorsque je suis revenu à Air Canada le jour du poisson d’avril en 2009, personne n’a pensé que c’était par courage. Certains ont dit que c’était une forme déplorable de sadomasochisme. De toute évidence, j’entrais en courant dans une maison en feu. Pour les sociétés aériennes, les années 2008 et 2009 ont été les pires depuis la Deuxième Guerre mondiale, effaçant les profits de la décennie précédente. Le prix du carburant a atteint des niveaux jamais vus, et le monde était en récession. Air Canada avait perdu un milliard de dollars en 2008 et les liquidités de l’entreprise étaient épuisées. Le déficit des régimes de retraite était dans les milliards. Toutes nos principales conventions collectives arrivaient à échéance. Les marchés du financement nous étaient pratiquement fermés. Tout se mettait en place pour une crise épique. En ce qui concerne notre équipe de direction, c’était l’occasion idéale de faire preuve de courage. À l’époque, j’ai comparé ces problèmes à un cube Rubik : nous devions nous occuper de toutes les faces en même temps, et nous ne pouvions rien régler avant de les avoir toutes résolues. Si déraisonnable que cela puisse paraître, nous devions tordre et tourner ce cube Rubik sous le regard de tout le pays, car Air Canada est constamment sous la loupe à l’échelle nationale. Notre équipe de gestion devait non seulement croire que c’était possible d’y parvenir, mais encore donner l’impression que c’était possible. Leur courage a porté fruit, car nous nous sommes tirés d’affaire. And now, a few years later, a great Canadian brand is once again a proud global champion for Canada with ambitious prospects for the future, with thousands of jobs and pensions saved. I tell you this story not for purposes of patting ourselves on the back. I tell you this to get at the root of courage. Often, when things are at their bleakest, when people have nothing to lose, they discover the greatest creativity, find the most unreasonable or crazy ideas and access their deepest inner resources – and are able to unleash their greatest courage. Which brings me to mindfulness. This is the third word I want to discuss. This third message is simple. Pay attention. Moment-to-moment awareness of present events can freeze-frame time, action and the reaction of those around you. You should be able to see, if not hear, a pin drop in the other end of a noisy room. Read body language. Learn how to enter the mind of those you are dealing with – whether they are your colleagues, your employees, your customers, your partners or your adversaries. Start seeing around corners. Somewhat theoretical, perhaps psycho-babble, you might say, but I suggest being ultra-aware helps not only to hone your muscle memory, it helps to better explain successes, failures, facts and circumstances in hindsight. To, in effect as Steve Jobs said in his now famous Stanford commencement address, “connect the dots”, as he did between the unique graphic designs he developed for Apple and his calligraphy class that he unofficially audited after dropping out. I have found mindfulness extremely useful in planning strategy, anticipating reactions, creating alternative realities and better seeing endings before beginnings. Practice it enough and you can practically read minds. You are all graduates of the social sciences – and are undoubtedly already mindful that you need to embrace soft skills, people skills, EQ, sustainability and social responsibility – the kinds of skills that you don’t necessarily learn from a textbook or online – if you are to succeed in your respective fields. La dure réalité est que vous aurez besoin d’une dose massive de connaissance, de courage et de conscience pour réussir dans le milieu de travail hautement concurrentiel et mondialisé dans lequel vous entrez. En fait, vous en aurez besoin beaucoup plus que j’en aurais eu besoin moi-même quand j’ai obtenu mon diplôme, en 1980. Pourquoi? Parce que se situer dans la moyenne n’est plus suffisant. (« Average is Over ») Pas en éducation. Pas en affaires. Certainement pas dans le contexte où la mondialisation suivra son cours et où les pays en développement ressembleront de plus en plus aux pays développés. Pas dans un monde où l’on vous propose sans cesse une multitude de choix, de divertissements et de distractions, et où votre téléphone intelligent peut parcourir 200 millions de sites Web. Pas dans un monde où l’on estime avoir fait plus de découvertes scientifiques ces 20 dernières années qu’au cours des 100 000 (cent mille) précédentes. Quand je parle des outils que représentent la connaissance, le courage et la conscience, ces mots ne se limitent pas aux personnes. Ils renvoient aussi à une certaine forme de culture d’entreprise indispensable pour éviter comme la peste la médiocrité. Avoiding mediocrity involves taking some risk. Avoiding mediocrity involves being globally audacious. Avoiding mediocrity involves being socially engaged in your communities – be they local or global. Avoiding mediocrity involves being as nimble as an entrepreneur in an emerging market. It involves operating in Beta. With courage. I have the privilege in my job of travelling the world. I get to see interesting emerging markets such as Brazil, China, Ethiopia, India, South Africa, Turkey, Dubai, etc. All of these emerging markets share three common traits, almost without exception: speed, flexibility and audacity. So as you leave this great institution, remember that every new beginning comes from some other beginning’s end. And my message to you today is that you need lots of knowledge, lots of courage and lots of mindfulness to contribute to our exciting world if you plan on elevating the bar, avoiding mediocrity and winning on a global ice surface. All of you have the raw materials, judging at least in part from what you take away from this unique university. You have already exhibited a capacity for hard work, and the discipline to study and complete what you’ve started. So as you now embark on the next stage of your lives and careers, primed to succeed, be unreasonable in your expectations, be aware, audacious and make your presence known in your communities and be courageous, innovative and speedy in your execution. The passage of time is arrogant and will not wait for you. So while today is for reflection and congratulations, tomorrow is for execution and success.